The Power of Now: A Guide to Spiritual Enlightenment by Eckhart Tolle | I was introduced to this book by a friend in the days following us learning of Donna’s diagnosis. I admittedly have just gotten started on it, but holy wow. It is most definitely one that is inspiring deep thought and introspection. In the first chapter, Tolle introduces readers to enlightenment and its natural enemy, the mind. He awakens readers to their role as a creator of pain and shows them how to have a pain-free identity by living fully in the present. The Now, as he refers to it. Tolle himself describes the book as a slow read, one to ingest and partake in methodically — returning to already read sections and allowing for ample reflection time following each reading session. Unglued: Making Wise Choices in the Midst of Raw Emotions by Lysa TerKeurst | A friend of mine actually gave me this book at the very beginning of the year. At the time I was finishing up a couple of other reads and, currently, it is still sitting in the queue. I am excited to begin reading it because the premise to me is not only practical, but something I can relate to at any season of life — considering myself a fairly emotional being. I think I am most anticipatory of how the author chooses to incorporate biblical teachings into her real life examples. 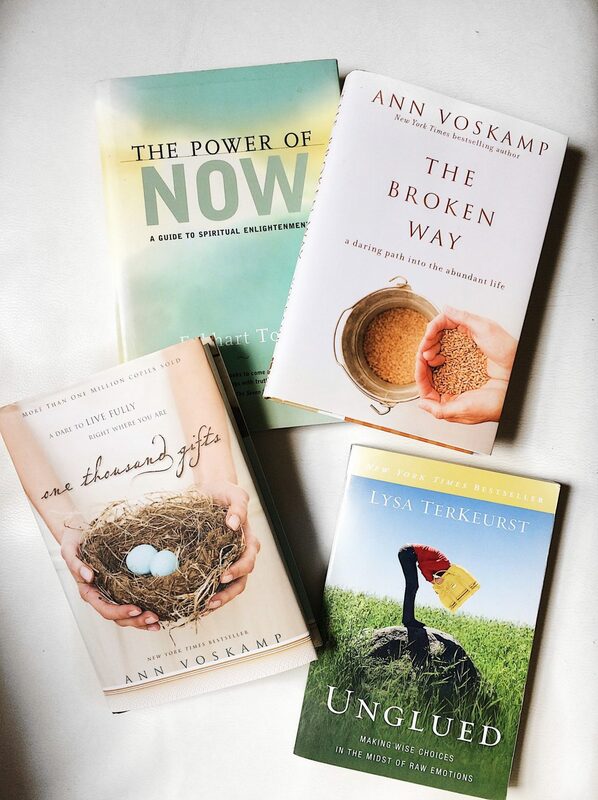 The Broken Way: A Daring Path into the Abundant Life by Ann Voskamp | These last two titles were given to me by none other than my favorite person, my husband Nick. He encountered the author, Ann Voskamp, during some of his research surrounding Donna’s diagnosis. She is a fascinating, impressive and inspiring individual, so I am excited to not only have one, but two of her books on my short list this summer. One Thousand Gifts: A Dare to Live Fully Right Where You Are by Ann Voskamp | I have just begun this title over the last few days and have already been moved to the point of tears. I am excited to share with you my thoughts as I make my way through this book as well as the others I’ve mentioned. I plan to continue discussions, etc. regarding these titles via social media — most likely via my Instagram stories. Have you read any of these titles? Are they on your ‘to-read’ list as well? I would love if you would share your thoughts with us in the comments! This post contains affiliate links. Thank you for supporting The Lovely Laura Life.